Allie Green, a rookie cop hired and desired by a private investigator, is about to knock the wind out of his chest with the biggest news of her life… right after she shakes off the fact, that her boss, lover, and the man she thought she would spend the rest of her life with, just fired her. Tristan, owner of Cross Enterprises, has a few surprises for the love of his life, as well. And Allie won’t see any of them coming. As pregnancy hormones heat up their love-lives, danger lurks in the background. While Allie and Tristan juggle a new relationship, work and a growing romance, ghosts from Allie's past come back to haunt her, slowly calculating the timing of their return. Distracted by secrets from his past, and Allie’s stubborn nature diverting her focus, fate has stacked a deck against the expecting couple and the deck is about to tip over. Because when danger comes in disguise, any distractions can be fatal. 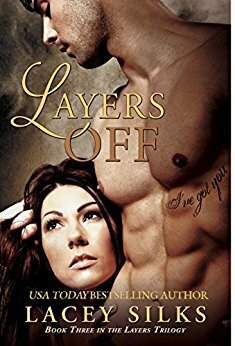 Get absorbed in Layers Peeled as Allie and Tristan struggle to stay out of harm's way and fight to keep their happily ever after, alive. Warning: Intended for adult audience. Note: Layers Peeled is Book 2 in Layers Trilogy and should be read after Layers Deep. "An author's job when writing a book is to entertain and to craft a story that has characters that are interesting. Ms. Silks has definitely done this with this series. I read the first book and had to immediately buy the second book. This story has suspense and passion and mystery all wrapped up together to make for a very entertaining book that it well worth the money. I do not want to put any spoilers here,..."
Other Books in "Layers Trilogy"